Our Puppy costume is our bodysuit with a few key details added. The contrasting shaped belly panel starts at the top of the collar and continues down over the belly, through the crotch and ending at the rear, under the tail. The Simple Belly Panel, which rounds off just below the waist, is also available. Choose the Tail style closest to what you want, then just make a note of the Dog breed or style you would like. Furry Tail and example of a Long Tail are shown. Added Hood, Hand and Feet options are available, as well as plumbing zippers. 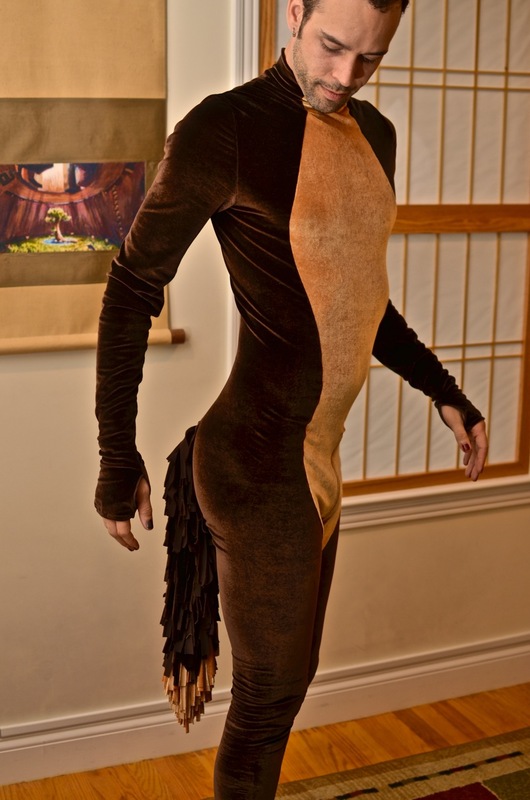 The costume shown is in Brown Velour with custom Tan Velour contrast, Furry Tail and Thumb Stirrups. I’ve found that the preferred fabric for a Puppy is Stretch Velour, but it really can be done in any fabric so you’ll see all of our fabrics listed. If you don’t see the color or type of fabric you want, contact me for custom fabric options.